WILLIAMSPORT, Pa. – After posting the Middle Atlantic Conference’s top single-game rushing total this year, Lycoming College junior Blake Bowman (Valley View, Pa./Tri-Valley) has earned his second MAC Offensive Player of the Week award of the season, the conference office in Annville, Pa., announced on Sunday, Oct. 25. 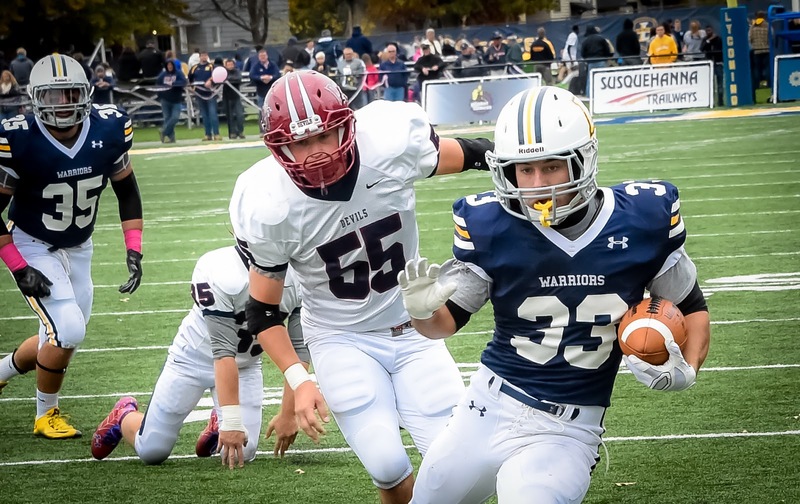 Bowman rushed for 281 yards, the sixth-highest total in Division III this season and second-highest in school history, on 30 carries for Lycoming in a 44-20 win over FDU-Florham on Saturday, Oct. 24. In front of the Homecoming crowd, Bowman also became the first player in program history to post back-to-back four touchdown games, scoring on runs of 12, 23, 19 and 31 yards. The junior has run for more than 100 yards four times this season, earning his first career player of the week award after a 26-carry, 140-yard game against Wilkes in the season’s third week. Bowman leads the MAC with 13 touchdowns and 12 rushing scores, with both of those marks just one shy of the respective school records. He is also just 146 yards shy of becoming the 11th player in school history to rush for 1,000 yards in a season and his 1,104 all-purpose yards lead the conference and are already 19th in school history. The Warriors get back on the field on Saturday, Oct. 31, when they head to Widener for a 1 p.m. MAC showdown.